Looking for a place to escape with your family or a small group of friends? Look no further than Runaway, a 4-bedroom cabin in beautiful Wears Valley! With back porch views overlooking the rolling hills of the Smokies, Runaway is an ideal cabin for a peaceful retreat. 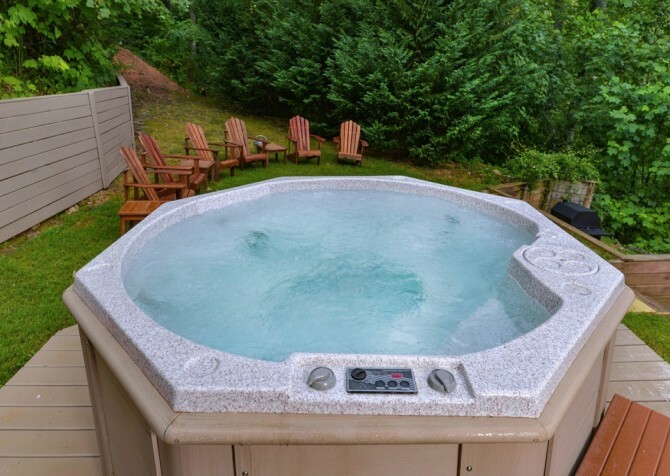 You’ll enjoy rocking chairs, patio tables, and an outdoor hot tub with unforgettable views. 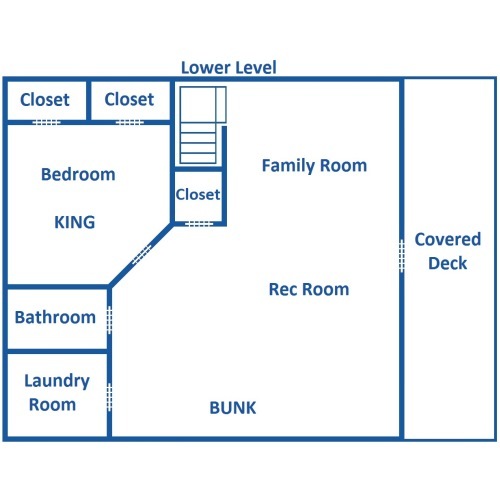 Inside the cabin, enjoy 3 floors with bedrooms and bathrooms on each for your convenience and privacy. Total, Runaway comfortably accommodates up to 12 guests—perfect for 2 or 3 families traveling together, a small group retreat, or a couples’ getaway. 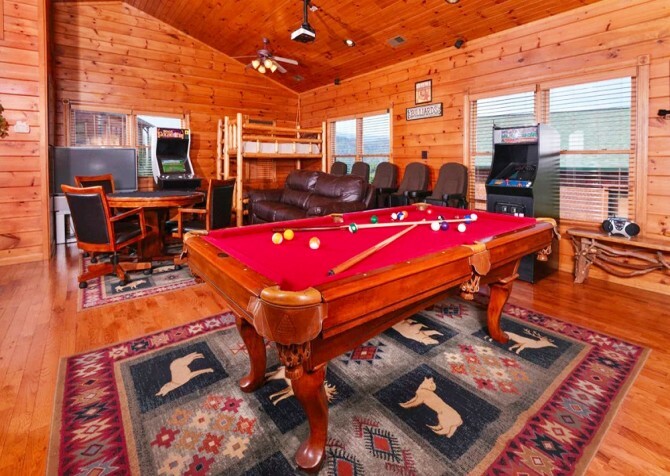 Along with 4 bedrooms and 3 bathrooms, Runaway offers a spacious game room, a cozy living room (with a big screen TV and gas fireplace), and a traditional log cabin design with exposed beams and an A-frame ceiling. The décor in this cabin mixes traditional Smoky Mountain design elements with comfortable furnishings and classy appeal. Book Runaway for its gorgeous mountain views, its spacious layout, and its convenient location only 6 miles from the attractions, shops, and restaurants of downtown Pigeon Forge. 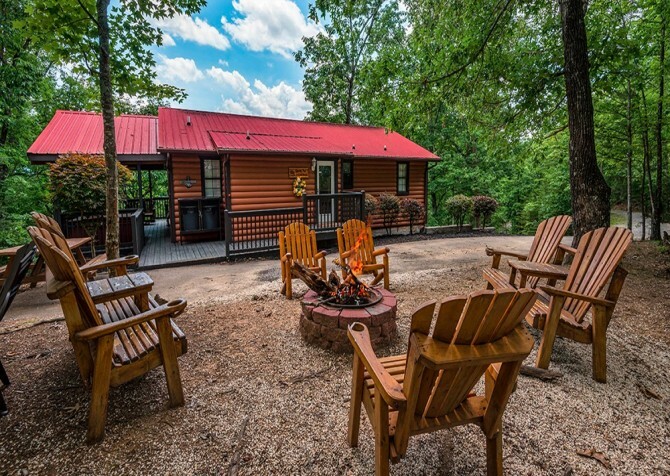 Located on the main floor of the cabin, Runaway’s living room is your perfect spot to relax after whitewater rafting down the Pigeon River, horseback riding in the Smoky Mountains, or taking a hummer tour nearby Gatlinburg. Sit back on the comfy full-size (reclining) sofa, the matching recliner, or the coordinating loveseat provided by this space. You’ll easily fit the majority of your 12-person group here for family movie night or a gift swap during the holidays. And if you need more chairs, simply pull up a few from the nearby dining room—this cabin’s open-concept main floor makes it easy to keep your group together for special events. Along with a big screen TV and DVD player, Runaway’s living room comes with a stone-faced gas fireplace that will keep you warm on those chilly winter evenings. Snuggle in front of the fire with a warm blanket and your tablet (Runaway comes with high-speed wireless access), spread a board game on the coffee table, or sip on a glass of lemonade while you relax in the rocking chair and look out through this cabin’s back wall of windows. The peaceful green ocean of trees provides the perfect way to unwind during your visit to Pigeon Forge. Or visit Runaway in the fall for the beautiful kaleidoscope of red, yellow, and orange crawling across the rolling Tennessee foothills of the Smokies. No small group cabin is complete without a fully equipped kitchen. That’s why Runaway offers a cozy kitchen with all your cooking essentials. Take advantage of having all your major appliances throughout your stay as well as a coffeemaker, dishes, and utensils. Plan for a holiday meal with the family or a Labor Day barbecue using Runaway’s kitchen along with the gas grill on the porch. Another perfect use for this cabin’s full-size kitchen is to make hearty breakfasts each morning before you head into town. Stop by the grocery store for eggs, bacon, milk, and butter, and then head over to The Old Mill General Store in Pigeon Forge for fresh-ground grains, including grits, a variety of flours, and their famous pancake mix. They also have a selection of homemade jams and jellies—the perfect companion for toast and English muffins. Serve up your delicious homemade meals inside Runaway at the 6-piece dining table right beside the kitchen. This beautiful wooden table is surrounded by even more beautiful views, thanks to the wall of windows lining the back of this cabin. If you need more seating, use the breakfast bar, with 4 stools, that’s attached to the kitchen. Runaway also provides an outdoor dining option with a U-shaped patio table for 4 that directly overlooks the Smokies. Although Pigeon Forge restaurants have tons of delicious cuisine options for you to try—including pit-smoked, Tennessee barbecue and all your Southern-style favorites—you won’t beat the mountain views offered by Runaway! The hardest part about traveling with a small group (besides keeping everyone fed) can often be keeping everyone entertained. Some in your group want to watch a movie, some want to watch TV, some want to sit and relax, and some are looking for something fun to do. That’s where the game room inside Runaway really comes in handy! This large, carpeted space is cozy and full of options to please everyone in your group. Enjoy a game a pool on the pool table or play some music on the stereo. Lay back on the couch for a catnap or play a board game at the 4-person table. This game room provides hours of indoor fun for a rainy day and affordable options for fun if you’re trying to stick to a budget. Of course, the Smoky Mountains area has plenty of affordable options as well—including a visit to the Great Smoky Mountains National Park, one of the only national parks that is FREE to all visitors! When you’re back from the national park or from your evening adventure in downtown Pigeon Forge, Runaway has exactly what you need for a comfortable night’s sleep. This 12-person cabin features 4 bedrooms and 3 bathrooms spread out on 3 different floors. In the loft, you’ll find a king-size bed with its own bathroom. 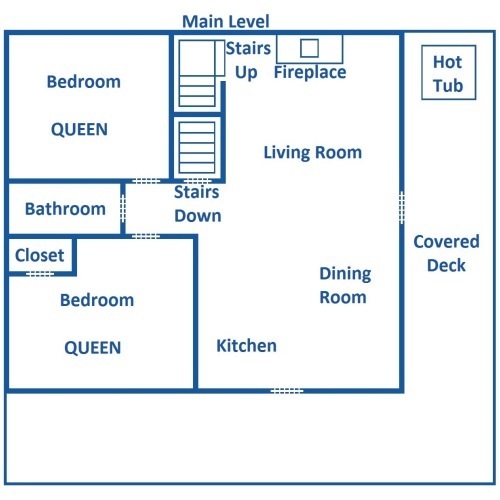 The main floor has 2 bedrooms, each with a queen-size bed, and 1 shared bathroom. 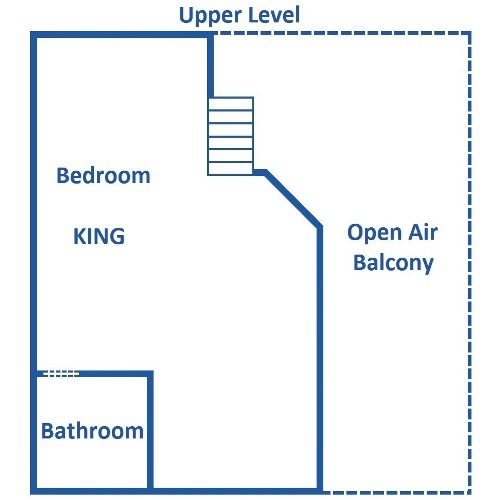 The lower level has 1 bedroom with a king-size bed. You’ll also find a twin bunk on the lower level and additional sleepers inside this cabin, providing enough space for several families or a small group of friends. The lower level has been renovated to include a bathroom for more convenience to the guests sleeping on this floor or when everyone is having fun in the recreation room. Enjoy homey décor in each of the bedrooms as well as individual flatscreen TVs in every room! 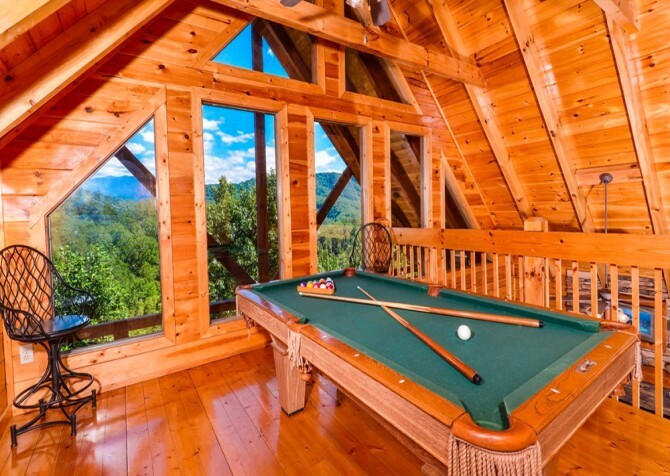 With Runaway’s location in Wears Valley and atop the breathtaking Dogwood Farms, you’ll appreciate the many outdoor amenities that allow you to soak up this cabin’s amazing mountain views. On the covered back deck, you’ll find several seating options, including cushioned patio sets and wooden rockers. Grab your mug of hot coffee in the mornings and head to the deck for a Smoky Mountain sunrise during your stay. In the evenings, change into your swimsuit and take a relaxing dip in Runaway’s outdoor hot tub. This is a great amenity for releasing tension or relieving sore muscles—you might even look into booking an in-cabin massage! Finally, enjoy the outdoor dining table, additional chairs, and gas grill provided by this cabin. If you’re hoping for a peaceful and refreshing stay in the Smokies, Runaway has the right mix of outdoor amenities for you! Along with the amenities already listed, Runaway offers a flat, paved, circular driveway that makes parking easy for caravans. Keep in mind, though, that the roads to this cabin are narrow and curvy and will not accommodate a bus. For your convenience, Runaway also offers access to high speed wireless and to a washer/dryer. You won’t miss the comforts of home when you stay at a cabin like Runaway! Sail through the Smoky Mountain trees at speeds of up to 25 miles per hour at Smoky Mountain Ziplines. This exciting attraction offers 2-hour canopy tours with minimal walking. If you’ve gone ziplining before and want to try something new, try the Dome Zipcoaster. Not a zipline and not a mountain coaster, this attraction is something all its own! You can hike through the mountains…or you can ride through them on a mountain coaster—we’ll let you decide what sounds more fun! "We stayed at the cabin "Runaway" such a peaceful cabin in Dogwood Farms Resort! Had a very nice view across the Mountain Side & over the Pigeon Forge area. If you want a nice peaceful vacation cabin this is a good option!" We are so happy to hear you enjoyed your stay at Runaway. We agree that the view is wonderful, and we love that you described it as peaceful. Thank you for choosing Cabins for YOU for your smoky mountain vacation. We look forward to serving you again in the future. "I absolutely LOVED Runaway! Great service. Awesome cabin! Just spent 4 amazing days with a great group of ladies, and we all loved the cabin! Spacious layout, peaceful and serene. The customer service was always available during the booking process. I can't wait until our next retreat!"